I cannot explain why this fact is so, but through my anecdotal research, I have discovered that nearly all of the Snooze Button Generation remembers "The Brady Bunch" episodes in Hawaii. I was not an avid "The Brady Bunch" watcher, and, like most members of the SBG, only saw "The Brady Bunch" on reruns. But, man, that show where the kids discover a cursed talisman was memorable. I do not believe in cursed talismans, or idols, or anything of that nature, but that Brady clan was m-f-ing cursed in Hawaii. 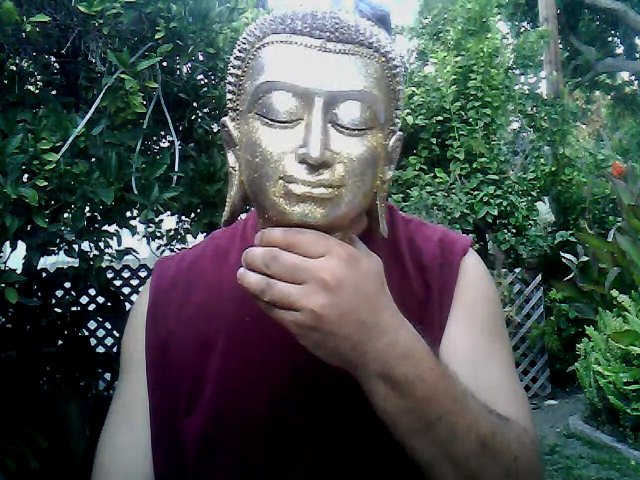 This is all coming to light because I, too, have been cursed item by a relic - a Buddha head. 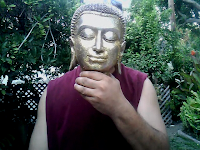 My cousin Steve and I found a wonderful Buddha head, and since its purchase, bad karma has followed me, just like bad waves followed Greg Brady in Hawaii. Where did we discover this cursed relic? Well, we bought it at an exotic store called Ross Dress for Less. How could such a rare, and unfortunately cursed item, be at Ross Dress for Less? Well, those gods are pretty darn tricky when passing out their curses. Since obtaining the head, the following three things have happened that made me realize it is cursed: 1) The city of Long Beach refused to take away my neighbors trash on his tree lawn unless the trash is bounded. The neighbor cannot do that because he is an octogenarian, vaguely mute and probably doesn't want to risk soiling his beige Member's Only jacket. I likely will take care of that garbage in a day or two. 2) The Salvation Army refused to take away a sofa in which I tried to donate. I really didn't know the Army was so picky. I loved the couch for the past two years. 3) I got sick at a party at my house, despite having just one drink. I had to miss most of the party due to a very bad tummy, fever and sleep. That was a bummer, and my tummy still is recovering. Now, some people might say these three things do not necessarily mean I am in the possession of a cursed relic and are mere coincidences. Obviously, those people need to read more and are fool-hearty, believing the gods can't zap them at strip malls.